Justin Jackson and Joel Berry reached two Final Fours with the Tar Heels. When a group of college basketball players arrives on campus at the same time, comes together and wins at a high level, it can make for a memorable run. As a fan, it’s easy to take an interest in teams whose players have been through the trenches together. 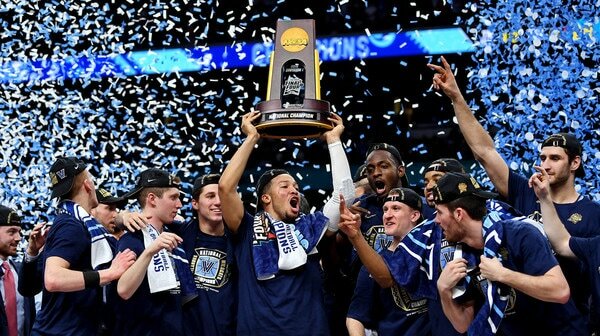 Brunson is perhaps the most decorated player in Villanova history, winning two national championships and winning the Naismith in 2018. He was the starting point guard on both squads and went an astounding 103-13 as a Wildcat, posting one of the best winning percentages of any player in modern college hoops history. And then there’s DiVincenzo, who scored 31 points in the 2018 national championship game and was one of the most explosive scorers in the country as a sophomore. He redshirted the 2015-16 title season, which shows how deep Villanova that year. These were two guys who played a primary role in multiple national title runs, and they won a whole bunch of games together. Doesn’t get much better. Jackson jumped to the pros and is now a member of the Sacramento Kings, but Berry and Pinson are set to enter their final season together in Chapel Hill. This class was highly touted from the jump and it didn’t just live up to the hype. These guys exceeded it. Of course, there’s the 2017 national championship. Jackson and Berry were North Carolina’s best players, while Pinson was a supremely valuable complementary piece. There’s also the 2016 Final Four, which obviously didn’t end as the Tar Heels hoped, but that team was awesome. These three played key roles on that squad, too. The Jackson-Berry-Pinson class went 13-2 in three years of NCAA tournament games. Do you realize how hard it is for some schools to win one NCAA tournament game? That’s an absurd statistic. Overall, this trio won 92 games in its three seasons together, took home a national championship and was inches away from snagging a second title. Jackson won a conference player of the year award. Berry could win it as a senior. This class will go down as one of the best in North Carolina history. Okafor, Winslow and Jones may have been at Duke for only one season, so they typically wouldn’t qualify for this list. But two things: First, they won a national championship. And not just any national championship. They won it in 2015, a season stacked with great teams in which Kentucky, Wisconsin and Arizona all could have run through the tournament. Second: They weren’t just there to witness a championship. They were the three biggest reasons that Duke won the title. Okafor, Winslow and Jones were dominant. Simple as that. Of course, there’s also Allen, who scored 16 points in the championship game and averaged 21 points as a sophomore. He was a third-team AP All-American that year. If he can peform similarly as a senior, he’ll go down as a Duke great. Okafor, Winslow and Jones will be seen as different kinds of Duke greats, three of the most talented players to ever don a Blue Devil uniform, though they were on campus for only one season. Given the spirit of this discussion, these guys weren’t locks for this list. But the four of them accomplished too much to ignore. This might be the most interesting class ever. It’s really all over the place. You have Embiid and Wiggins, who were in Lawrence for only one season. Both were good for the Jayhawks, but were considered better NBA prospects than they were college basketball players. Kansas lost in the second round of the NCAA tournament in their freshman season. Still, these are two of the most talented guys we’ve ever seen play college hoops. Not hyperbole. Then we get to Mason, who wound up being the crown jewel of the class despite being an afterthought when they all started. He won the Naismith as a senior and notched a whopping 116 wins for his career. Mason was the best player on two teams that reached the Elite Eight. Sure, Kansas would have liked to have made a Final Four during his tenure. But his career was a masterpiece. To add icing to the cake, Lucas was a quality two-year starter on those Elite Eight squads, and Selden was a revelation as a junior, averaging 14 points on 40 percent 3-point shooting. When Lucas – an above average starter on a great team – is the worst player in a five-man class, you know you’re dealing with something phenomenal. Stauskas was the Big Ten Player of the Year as a sophomore, averaging 17.2 points on 44 percent from 3. Robinson averaged double-digit scoring for his career. McGary made the NCAA all-tournament team in 2013. LeVert will likely end up being the best NBA player of the bunch, and Albrecht went bonkers as a freshman in a national championship game. When Michigan made it to the national title game in 2013, it had Tim Hardaway, Jr. and Trey Burke. The rest of its key pieces? This class, more or less. This group helped put Michigan basketball back on the national map. This trio has a combined NCAA tournament record of 10-3. Hayward was the Horizon League Player of the Year in 2010. He and Mack will go down as two of the best players ever to wear a Butler jersey. Between 2008-09 and 2010-11, the Bulldogs won 87 games. Mack and Nored were members of all three squads, Hayward a member of two. Going deep into the NCAA tournament multiple times? Check. Producing NBA talent? Check. Playing a key role in making Butler a national brand? Check. These three left quite the legacy in Indianapolis. The gold standard. The first school to repeat as national champions since Duke in 1991 and 1992. Noah, Horford, Brewer and Green are icons in Gainesville. The foursome went 13-1 in three years of NCAA tournament games. Overall, they posted a record of 92-19. Horford and Noah will go down as one of the most dominant frontcourts in NCAA history. Perhaps the biggest testament to their team unity: No Gator won a conference player of the year award during that three-year stretch. In 2006-07, their second national championship season, all four of them averaged between 12 and 14 points per game. MORE: Who's had the most combined football and basketball success? As far as team basketball goes, this is as good as it gets. We haven’t seen another class like it. We may not any time soon. You’d think this class would have easily made this list, but it was a tough call. Felton, McCants and May were the three best players, as juniors, on a national title winner. Noel was a key complementary piece. Surely, their careers were sensational. In 2004-05, yes, North Carolina was awesome. The Tar Heels won 33 games, May averaged a double-double, McCants was an elite scorer, and Felton was one of the top point guards in the country. But success didn’t come easily, or early, for these guys. Despite each putting up gaudy individual numbers, the Tar Heels missed the NCAA tournament in their first season. In year two, UNC went dancing but won only 19 games. Truth is, these three underachieved, in terms of wins, as freshmen and sophomores. But they more than made up for it as juniors, and they still posted impressive individual stats as underclassmen despite the lack of victories. Bottom line: The talent was undeniable, and that 2004-05 team was one of the most dynamic squads we’ve seen in college hoops in the past 15 years.